Within this context of a fragile and unstable economy, creating quality employment has become one of the most pressing priorities worldwide. Jobs mean development. Work makes it possible to overcome poverty. Decent and productive employment is the way towards growth and the diversification of economies in all countries, whatever their level of development. This is why, at a time in which the UN and the international community have agreed on the Post 2015 Development Agenda, where employment occupies a key position, we have launched, as a tool to implement this agenda regarding youth employment, the International Campaign for the Declaration of the Youth Employment Decade: a civil society initiative, designed and promoted in Bilbao by the Novia Salcedo Foundation and coordinated by the Government of Spain, in favour of youth employment as an opportunity and a driving force to transform the economy and social fabric of organisations and countries; the final goal of which is for the General Assembly of the United Nations to declare the “YOUTH EMPLOYMENT DECADE”. A declaration that will encourage Member States to consider youth employment as a priority in their policies and that will engage them in achieving the goals established. The Action Plan makes it possible to measure and structure actions aimed at achieving the Decade’s main goal: actively promote the design and implementation of public policies and best public practices that will lead to decent employment for young people. It will be necessary to contribute to the efforts of the UN and of its organisations in coordinating and monitoring the actions aimed at a joint response (by the various agents and international, national, regional and local agencies) in deploying a global strategy to comply with the international commitments entered into regarding youth employment and related issues within the framework of the SDGs approved in September 2015 and other objectives regarding youth employment agreed at an international level. 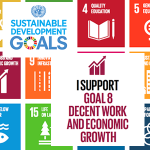 “8.3 Promote development-oriented policies that support productive activities, decent job creation, entrepreneurship, creativity and innovation, and encourage the formalization and growth of micro-, small- and medium-sized enterprises, including through access to financial services”. The implementation of this Plan of Action will require a commitment, public-private cooperation as well as private-private, and continued investment, with due attention to youth participation and gender equality in all the activities that are defined in the general framework of the Decade. Furthermore, each Member State will have to adapt and formulate this action framework in accordance with their specific context and situation. The Decade will also focus on encouraging countries to prioritise, within their public policies, youth employment and the preparation of public and private management plans for the sustained integration of young people in the labour markets. These are actions, activities and programmes that give substance to the Decade and set out the lines of action that will be applied at a global level to achieve their goals. The idea is to establish a set of planned actions aimed at aligning the resources and potential of the Decade in order to achieve long term targets and goals, as well as choosing the actions and allocating the resources to achieve them. We propose the Supporting Office for the UN Youth Employment Decade to be based in Spain. These strategic activities will be carried out throughout the Decade and will comprise its overall framework, which will be materialised via biannual work plan, and will be adapted based on the context and situation of each Member State through the National Committees, created for this purpose. This involves putting in place training programmes for national, regional, and local administrations and for civil society organisations regarding public policy or public-private partnerships on youth employment, defining specific goals adapted to the various realities, drafting of work plans and performing specific activities. While the circumstances, priorities and specific needs of each country are different, all national development strategies should place employment objectives at the heart of their projects with the necessary margin for the design and adaptation of policies at national level. In other words, each government should establish their own national goals guided by the global strategic Action Plan. With this in view, the creation of National Committees consisting of various public and private agents will be facilitated and encouraged to act as dialogue and negotiation platforms on youth employment policies that adapt to each countries goals. An indicator assessment and monitoring method will be established based on the procedures that the UN sets out in these cases. Annual monitoring reports will reflect the results achieved each year and the problems that have arisen regarding goals and indicators.